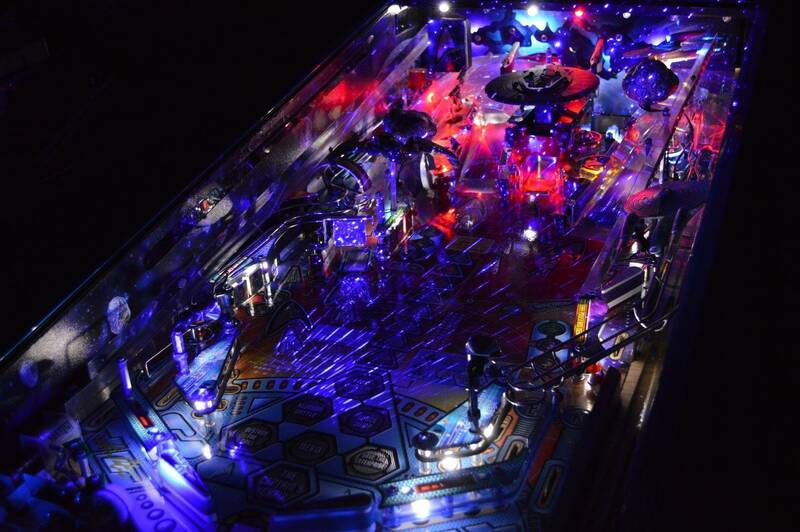 I am pleased to announce our stunning upgrade to the stock Stern Star Trek laser that comes with the Premium and LE Stern Star Trek Pinball machines. 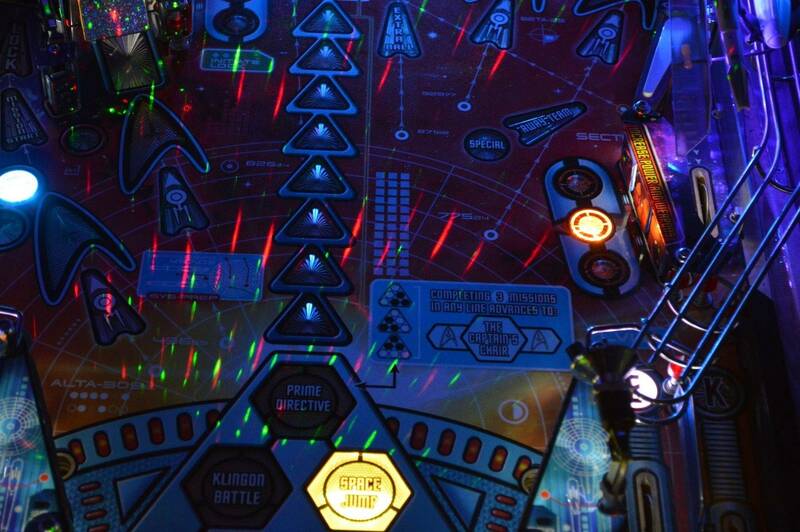 Our lasers offer much higher power than the stock laser so Klingon multiball laser light show be that much better. Green laser starts at $76 and is a bolt-on replacement. 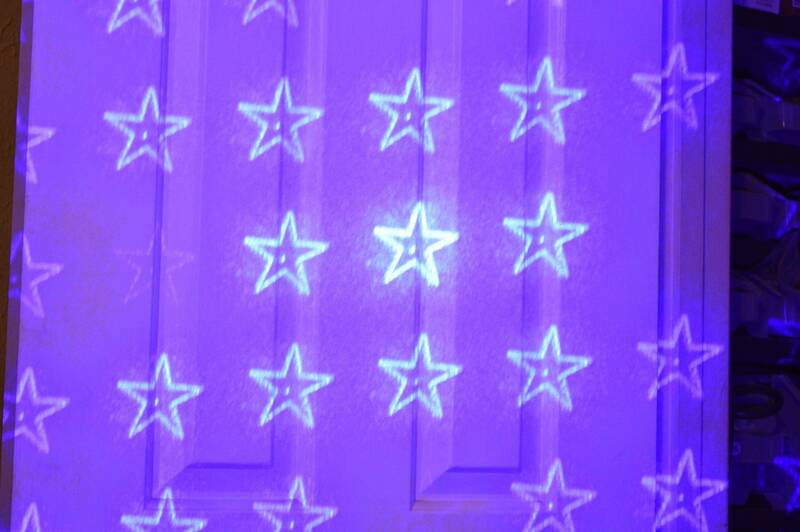 Blue lasers are still very expensive; so there is a premium for those. The Red lasers are marginally cheaper than the green ones. for detailed, reversible installation instructions. Zitt last edited this post 1 year ago. 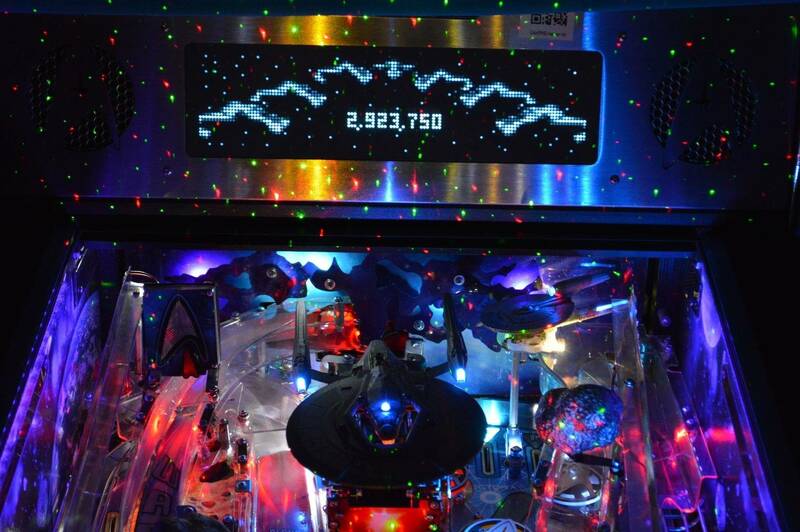 am pleased to announce our stunning upgrade to the stock Stern Star Trek laser that comes with the Premium and LE Stern Star Trek Pinball machines. 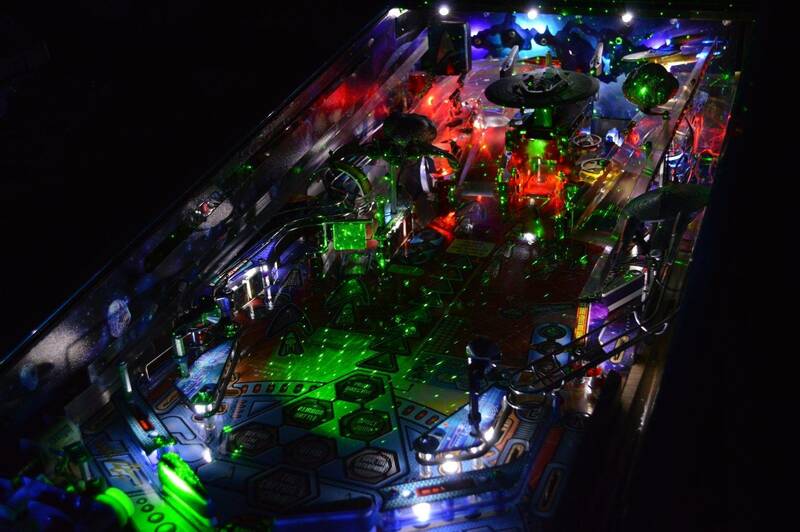 It seems to me that the green laser has a lot better contrast than either the blue or red lasers. So it appears brighter. Is that the case in real life? Rob - that it basically correct. which really the way the human eye reacts to the color spectrum. The Blue laser we sell is rated for 100mW... so that gives you an idea of how much power is needed to even get the level of brightness needed. I'd say that the Blue is slightly brighter than the stock red laser. Our red laser is between 1.5 and 2x the brightness of the stock laser. and the green is by far the brightest... probably 3-4x brighter. I personally put the Blue on my machine; even though it isn't a massive brightness improvement over the Red. I think the Blue looks better; especially combined with my prototype GI dimmer currently under development. 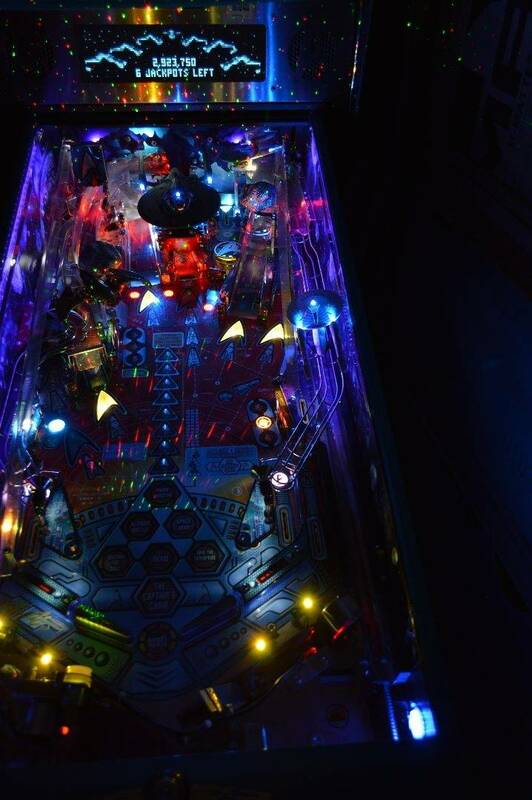 The Green looks great; but it just seemed out of place on the Playfield as there is no green in the art on the machine. Any timeline for the GI dimmer? Think I'll wait and order together. Combo package deal maybe? I'm assuming it's different than the blackout one in that it dims to a variable level and also blacks-out if you like? Nice to see some mod activity for ST, as more premiums are being produced, and I have one on order! When you get one adapted for my lowly Pro I will be sending you $$$! any timeline for the GI dimmer? Think I'll wait and order together. Combo package deal maybe? It'll be done when it's done. Lots of irons in the fire right now. I haven't even started the quoting process for the design yet. Right now; I'm trying to get to a point where I can assemble the second revision's prototype and complete the firmware and software apps. My gut say's it'll be june or july. As far as a combo deal; unlikely. At these volumes; there really isn't a huge profit margin. The best way to tell me you are interested is to use the "waitlist" link on the product page(s). This tells me roughly how many people are really interested; so I can ensure I get at least that number built. Umm... k. If you wanted a laser; why didn't you buy a premium? Due to our 16% off Site wide sale for BlackFriday (Use Discount code: BF2016); we are now out of stock on the green lasers. We still have about 5 or so Blue lasers... and 3-4 Red lasers. 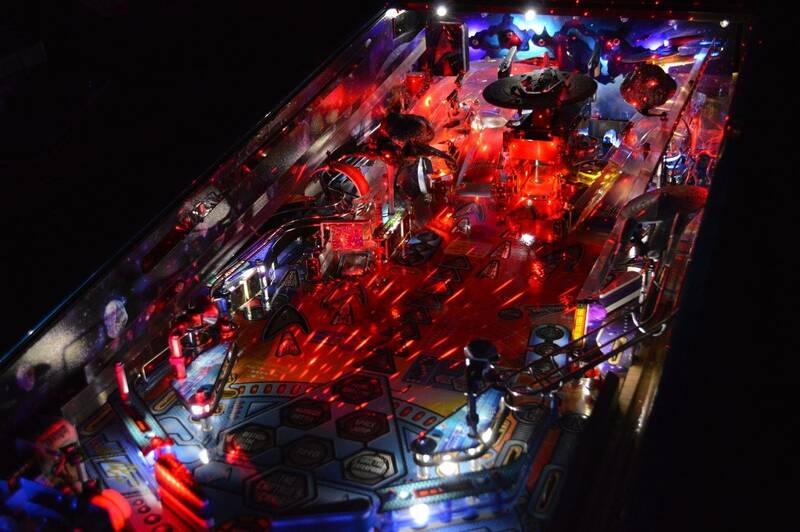 Our current laser vendor will not longer ship to USA; as a result, Pinball-Mods.com will be retiring this product when current stock is depleted. We only have a few red and blue lasers left; and will not be restocking green. Available as a first come-first served basis. Red Lasers are now Out of Stock. Only Blue Lasers are still in stock - of which I have 4 left. Damn! If somehow you find a red one hidden somewhere could I ask you PM me please. Sorry; I sold the last red one 4 days ago. I may have a new source for these lasers so may "un-retire them" if there is enough interest. It'll be several months... as I will need to sample them and verify the quality is what I expect. Ok. I have ordered samples from the new vendor with a couple of new lasers. I'm going to try a Blue laser with 3x the power of our previous lasers. 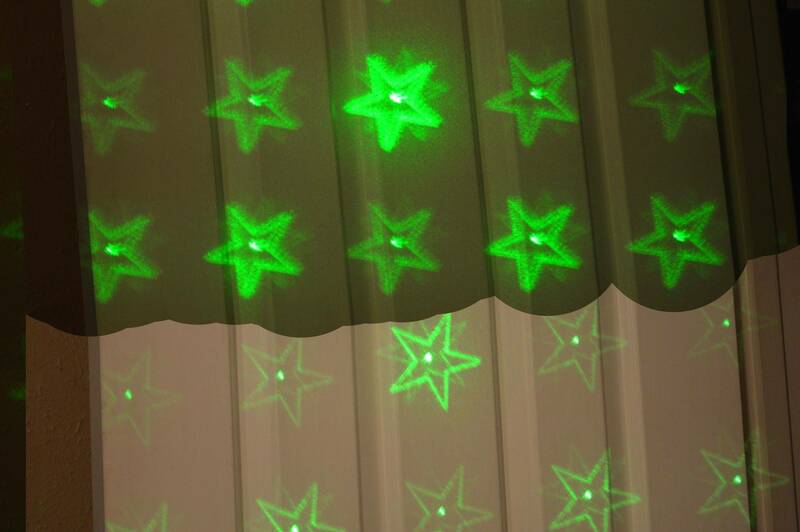 I have a "fat beam" green laser coming as well to see how different it looks if at all. Maybe some of the star field is brighter. I have a red coming as well for testing. Samples should be here in 30days. Great! Keen to hear your thoughts on them. Stop shipping to the largest economy in the world... seems like a good business decision. Well; the star diffuser splits up the one laserbeam into a lot of smaller tiny beams... so the "in theory" the sum of each star beam is = the power of the single beam. So; in this case... as long as the ?plastic? star cap doesn't burn under the power it should be good. Borygard... isnt their side of the pond... it's ours. I'm definitely interested in the un-retiring of the mod Will be watching this thread for updates. I am waiting for the new green one as well. 10 days to wait? Samples may arrive sometime next week - but haven't gotten a tracking number. Then I need to ensure they meet my expectations, order the production quantity, and wait for the volume parts to be built. If the samples arrive with issues; then the clock restarts. O.k, understand. Could you provide us with your test results, whether worth waiting or not. And please put me on the waiting list for a green one. I am also in once you are ready to go. Got the samples in today; unfortunately all but one were build to incorrect specifications. I was able to jury rig a powersupply to test the lasers. The pictures are taken with the same camera at the same lighting. The reason the door appears darker on the larger dot is because it's causing the camera to darking the white to respond to the much brighter/bigger dot. As you can see the stars are much brighter than the "normal" dot; but they are more "blurry". These green dots are not compatible with my GI dimmer due to the vendor building to incorrect specs. At the moment; I can't test in my machine but will try to do so in the coming days. My Blue laser was built to spec... and it's scary bright due to the power. I'm not sure I'm going to use the higher power because it shows that it can burn black electrical tape pretty easily (and I can feel it on my skin easily). Too much liability with a product like that. For giggles; I do intend to try it in my machine just to see how much better the higher power is. No luck with the red mate? I got the new lasers built to correct specs. Please note: The pictures below are taken in a dark room with our GI_Dimmer in effect. As you can see the FatBeam green laser does not really work in this application. The dots become round blobs. As I stated; while the effect is much nicer - I have real concerns selling this high power blue because of the safety aspects. I will grab a red one when you are ready to go with them, like the look of the green but cant get past the fact red is the 'Klingon' colour. Could I ask you to put one of your Warp Ramp LED's aside for me as well please? I will be ordering more but they seem to be low in stock! 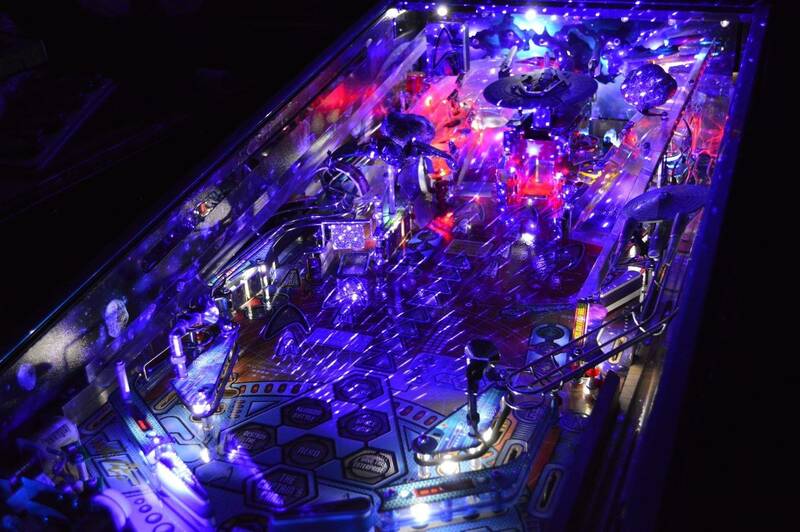 Warp leds are basically always in stock and always low as i build more when i run out. So, dont fret about those. That high power blue looks scary awesome . Got a brand new blue one available if anyone is interested. Some in Canada needs to buy this from you. I'll make the pot sweeter... I'll reset the warranty on the part for the new owner. Meaning I'll warranty the new owner for a full 30days. Keep in mind I'm out of stock on all lasers with an earliest available date of near end of next month (June). The lasers are back in stock on my website. there are different versions of the green ones depending on power. Differ the versions with regard of the size of the light dots itself or is the intensity of the light the only difference? Dot size is the same across all green lasers. The only difference that the lasers are binned by myself using a laser power meter. Experiment time: I wondered what would happen if I had a module with both a red and green laser in it... and what would it look like? Zitt, I'd like to see a dual color laser/s in ST. Interested for sure! wish we had a 2nd hole on the other side of the apron to make it easier. I'd have to have a "pre-order" list to judge interest... as dual color lasers would be more expensive than the blue lasers. GB isn't current offered by my manufacturing partner; but I think it'd be doable. Note: I've already asked and RGB isn't possible in the size restrictions of the Stern module. So; if people are interested in any of the options chime in - to encourage me to get serious about dual color lasers. These Lasers are eligible for our Black Friday 16% off Sale while supplies last. Discount does not apply to shipping.